The Play Outside Guide 2017 Holiday Gift Guide features gifts for outdoor guys, outdoor gals, and outdoor kids. We have EIGHT great prizes available too - enter the giveaways below! The first big snowfall gets me excited about two things: winter and Christmas! While trimming the tree and writing cards, we plan ski trips and snowy adventures. Sweet letters to Santa are carefully crafted and adorned with artwork so Santa will know who they're from. The girls ask for one special gift each year; sometimes just a candy cane! Our daughters started the one-item wish list as preschoolers. They were adamant that they didn't need anything at all, but Santa still surprised them with lots of awesome stocking stuffers in addition to their main gifts (and of course Mom and Dad did too!). When relatives ask what they can get for the girls, we request experiences (zoo passes), education fund contributions, outdoor gear (sled, hydration pack, ski goggles, snowshoes), or books. We have a moratorium on plastic toys! Check out our Gifts for Outdoor Kids below for handpicked ideas. Shopping for adults is a lot trickier - you can't just get something in their favorite colour - but we've curated some of our favorite things for Outdoor Guys and Gals we're sure you'll like. Things to wear and useful stuff! This year's Holiday Gift Guide has EIGHT (8) giveaways that are open until November 22 at 12 AM MST. Fill in the Rafflecopter widgets to enter and check eligibility requirements (Canada only or US only). Thank you to our sponsors for offering so many awesome prizes! Disclosures: Some of the products below were received free to test and review. Also, a tiny portion of purchases made through affiliate links support this website at no extra cost to you. Thanks for your support! Get happy feet with warm, winter boots or new hiking boots / shoes from KEEN! The Elsa boots are a top choice for women, but for super cold weather, I recommend the Elsa Premium boots with 200 g insulation (vs 100 g in the regular Elsas). My husband's go-to winter boots for extreme cold are the Revel III. He said his feet are warm for the first time in winter (he cycles to work year round, even in -30!). The Revel III also have 200 g insulation. For hiking, I love my Terradoras (light hiking, women's specific) and Targhees (stiffer sole, more durable for rockier terrain). 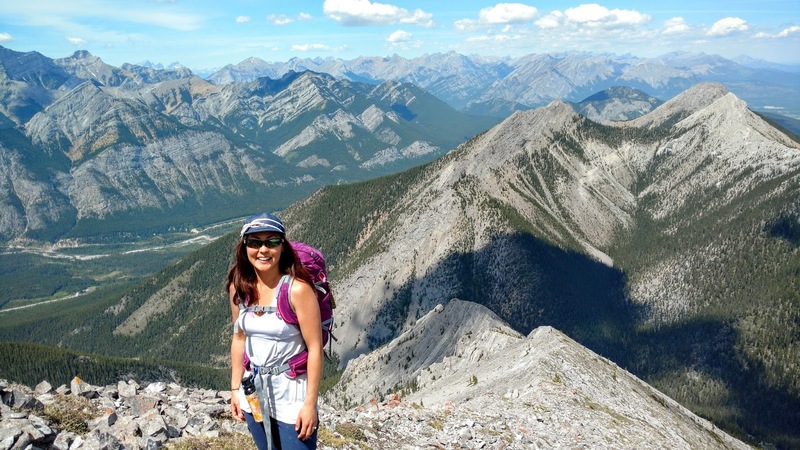 Enter to win one of 2 pairs of KEENs below (your choice, Canada only). Aventura Clothing makes stylish and comfortable women's wear from (mostly) eco-friendly fabrics. I love their clothes for every day wear, date nights, and travel. The organic cotton blends are so soft and comfortable and unexpectedly wrinkle resistant! Seasonal color palettes mix and match beautifully so you can easily make a capsule wardrobe. Enter to win an Aventura dress or top up to $100 (Canada and US) below. 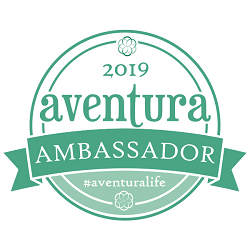 I have a limited number of 60% off Aventura codes for US residents (60% off your cart, up to $250); please contact me if you'd like one! Celebrating winter with the Aventura Jayla Vest. Ecōths is Aventura Clothing's men's line which also uses eco-friendly fabrics. As part of their Feed 3 Program, Ecōths donates 3 meals to feed one person for one day with the purchase of each garment. Since 2014, they’ve donated over 260,000 meals to food banks throughout the US and Canada. My husband is a big fan of their shirts! Enter to win an Ecōths shirt up to $90 (Canada and US) below. Hubby in Ecōths Hoodie and Joggers. Terramar Sports makes base layers and mid layers for all seasons. I wear them year round! The Cloud Nine leggings are cute enough to wear as regular leggings (shh.. don't tell anyone they're long underwear!) and the Thermawool (fleece-lined, no itch) top is perfect for skiing and the apres. Enter to win a "Top to Bottom Merino Wool" set: top, bottom and socks! (Men's or Women's, US only) below. Mystery Tackle Box - is a gift subscription for the fisherman or woman in your life. It's an awesome way to "discover new fishing products, learn new techniques and catch more fish". Receiving these boxes is like Christmas every month! Subscriptions range from $14.99/mo - $29.99/mo for 3-12 months (pick your plan & species of fish). I like that the Trout Fishing box came with high quality lures as well as instructions on how to use the tackle included. 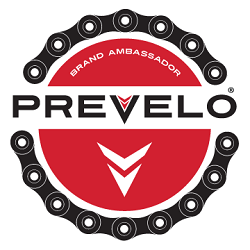 Use the code GIVEMTB for 5% off all gift subscriptions. 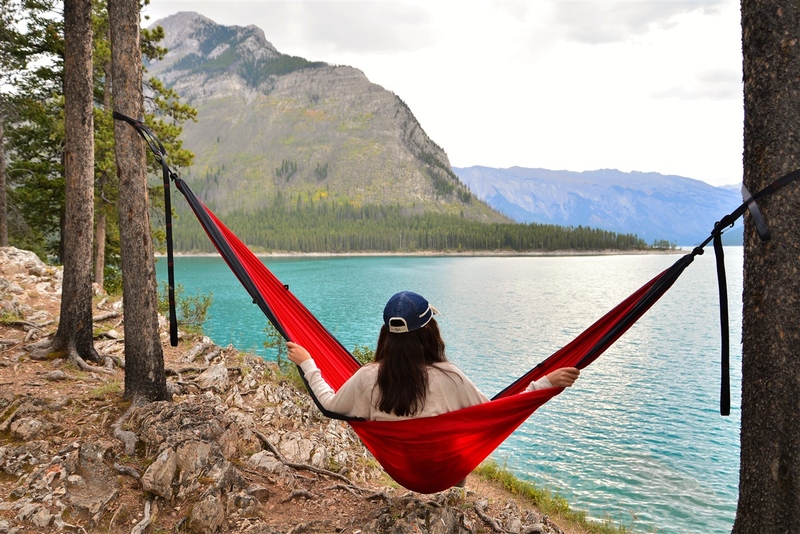 Serac Hammock said, "Come hang with us" so we did. We've had a Serac Sequoia XL double hammock for over a year now and taken it camping, hung it in the yard, and even taken it to the local park to sit in or lie down in. Hammocks may seem like summer gifts, but they're useful in the winter too, when there's nowhere to sit! The ripstop nylon, carabiners, and straps are high quality so we've had no issues with the hammock despite heavy use. Available in 8 colours. See our full review here: Serac Sequoia Hammock Review. With an RCR Card, your 1st, 4th and 7th visits are FREE at Nakiska, Fernie, Kicking Horse, or Kimberley. Only $99.95! 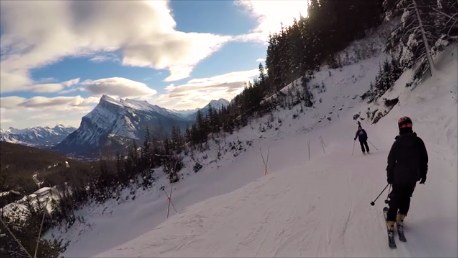 See what we like about skiing at Nakiska here: Why You Need a Nakiska Season's Pass or RCR Card. Get a Mount Norquay Big Drop Card and get 3 free ski days for the price of 1! Your 1st, 4th and 7th visits are FREE. Only $74! 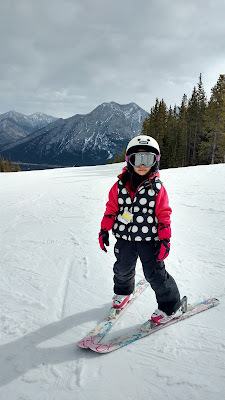 Read about our experience at Norquay here: Fun Family Skiing at Mount Norquay. MEC Hut Booties are not just for huts; they're a must-have for anyone who loves camping. We've brought these car camping and backpacking in cooler weather as they're so comfy and warm. 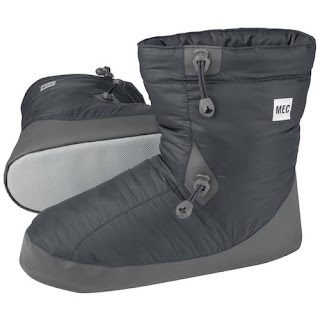 MEC Hut Booties - don't go camping without them! The Joby GorillaPod tripod is rugged and flexible so you can level it on a rocky summit or attach it to a tree for the perfect shot. I have the mini version for my GoPro and am asking Santa for the larger DSLR version that can hold more weight (up to 6.6 lbs). My husband got me this MEC Spicy Hoodie for my birthday and it's one of my favorite jackets ever. 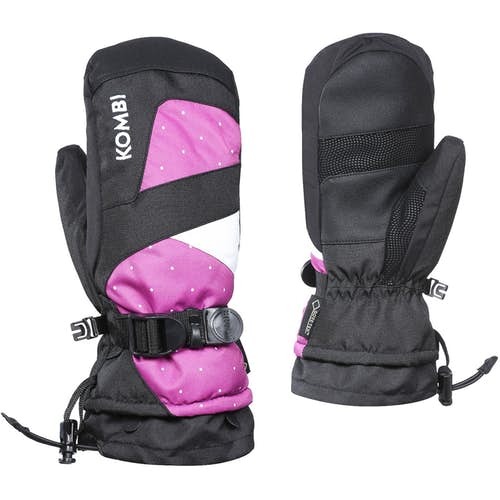 Its 850 down fill means it is really warm for its weight, but it packs down to nothing so you can bring it everywhere. Plus it looks really good. 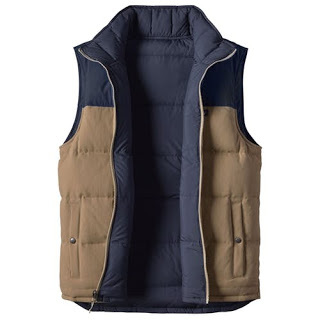 This Patagonia Reversible Bivy Down Vest (Men's) from MEC has a retro look, but technical features like 600-fill reclaimed down and DWR finish. The OUTAD Portable Folding Camping Chair is so awesome that after buying one, we bought another! This lightweight ultra-compact chair is super easy to set up and really sturdy compared to other similar makes of chairs (though this size is more suitable to folks of a smaller stature; taller version available if you don't like being so low to the ground). We like the OUTAD better than the Alite Monarch chair as it sits flat (the Alite tends to fall forward when you're in it). Only $40.99-48.99 depending on which colour you choose! The Black Diamond Whiz Kid Climbing Harness has all the features of adult harnesses, but is made for 5-10 year olds. The leg loops are easy to adjust for quick on and off. 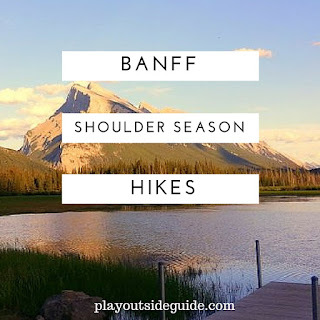 Available from All Out Kids Gear, a southern Alberta family-run store. 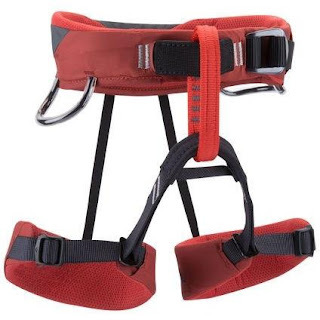 Enter to win this climbing harness (Torch or Plum colour, Canada only) below! Most of our favorite hats come from Sunday Afternoon Hats. They make attractive, high quality sun hats, beanies, fishing hats, you name it. 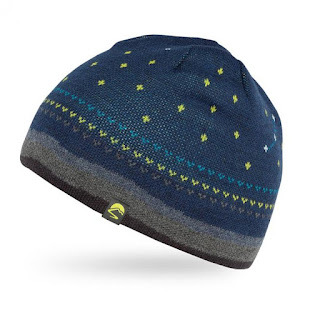 New for this Fall/Winter is the reversible merino wool Stellar Beanie with glow-in-the-dark constellations! Enter to win one below! The SportsStuff Sno-Nut is a high quality tube for serious snow or water fun! We've tubed on the Elbow River in this and used it for sliding on snow and love how comfortable the ride (or float) is. The outer cover is extremely durable and still looks like new despite dragging over sharp rocks on a river float. 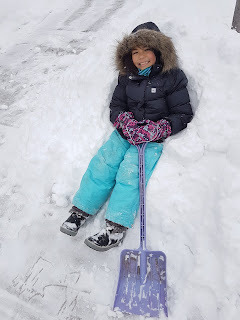 My kids prefer tubing to sledding as the ride is more comfortable and they get less snow in their faces on account of being higher off the ground. Check out our tubing video here! The Trout are Made of Trees Book describes how organisms in an ecosystem are related. My kids were fascinated by the interconnectedness of plants, animals and insects. Are your kids growing like weeds? Enter to win a pair of KEENs below (Canada only)! I am giving away TWO pairs - that's 1 pair each to 2 lucky people! Kombi The Racer Mitts are warm and waterproof with primaloft insulation and a GORETEX waterproof-breathable membrane. Available at MEC. More kids' stuff coming soon! Buff Merino Wool Scarf: It's a neck gaiter, beanie, ear warmer, headband and more! Wear it 12 different ways. I love the natural anti-odor quality of the merino buffs when we have back-to-back ski days. Available in tons of different patterns and colors to suit even the pickiest relative. Buff Merino Wool Neck Tube available on Amazon. Treat someone special to breakfast in bed! 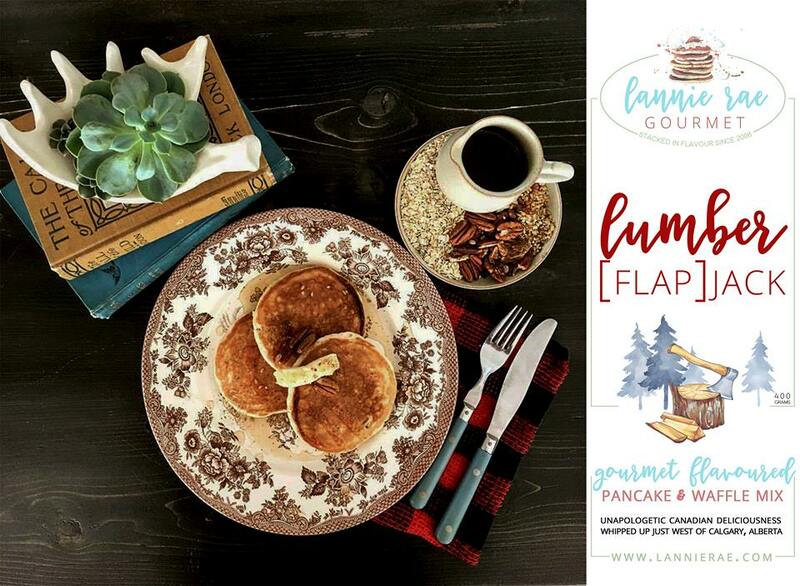 Lannie Rae Gourmet Pancake / Waffle Mix will make you a gourmet chef for a day! Enter to win a 3 pack of deluxe pancakes mixes (Canada only) below! Several delicious flavors available! Available at www.lannierae.com. Avoid chapped lips with a natural lip balm. We love the texture and smell of Burt's Bees Lip Balm! I've been reading my friend Linda McGurk's book, There's No Such Thing As Bad Weather and can relate to so many experiences.. people offering us a ride on our walk to school, struggles to get out the door some days, and the pure love of the outdoors. 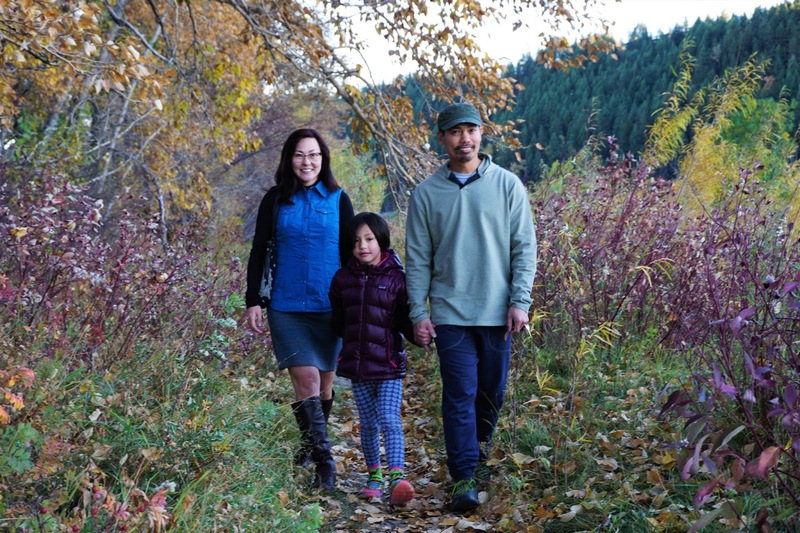 Linda blends personal anecdotes with research about the benefits of being outside, and shares tips on outdoor parenting from Sweden. A good read for any parent who loves the outdoors or needs inspiration to get out more. Dark chocolate rocks because it has a higher melting point than milk chocolate (I bring it hiking and backpacking year round).. plus it's good for you! Chocolate snobs will appreciate Amedei's Porcelana dark chocolate. 6. Thorlos Socks are designed for different activities and different foot conditions. My favorites are the Outdoor Athlete socks (for running) and Outdoor Fanatic socks (for hiking). The padded socks help a lot if you have plantar fasciitis. 7. Get a traveler a quirky luggage tag that reflects their interests like this awesome Harry Potter one! Get this luggage tag for a Harry Potter fan on Amazon. 8. 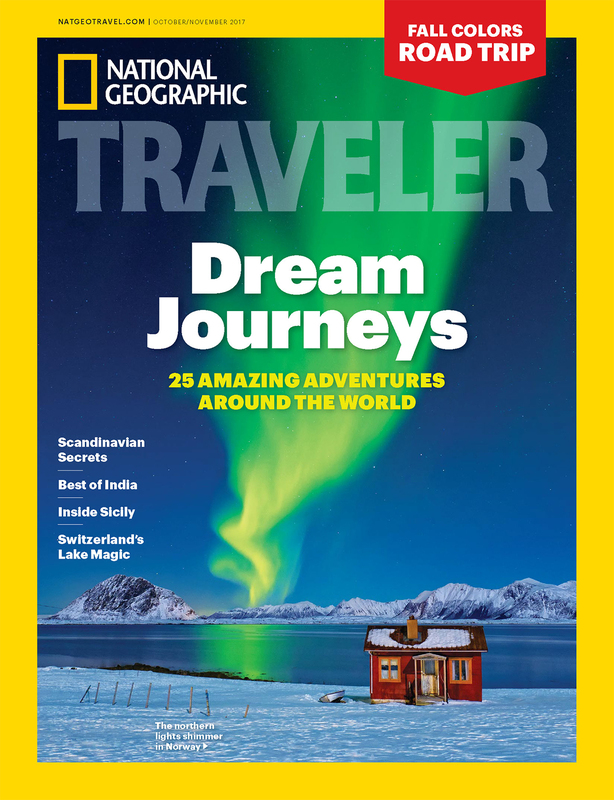 Warning: A National Geographic Traveler Magazine Subscription will cause wanderlust. 9. 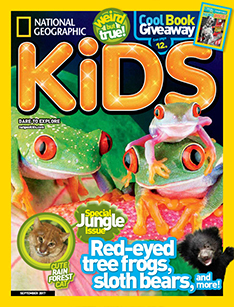 National Geographic KIDS is an awesome magazine to encourage kids 6 & up to explore the natural world. There's a little kids version too (3-6 years old). Entrants must be 18 years of age or older. To enter, fill in the Rafflecopter forms (below) for the contests you are eligible to enter (note: some prizes will ship to Canada only or US only). Winners will be selected randomly via the Rafflecopter app on November 22 at 12 AM MST and announced on the blog. Winners will also be contacted via email and will have 48 hours to respond after which time, if no response has been received, a new winner will be selected. Good luck! 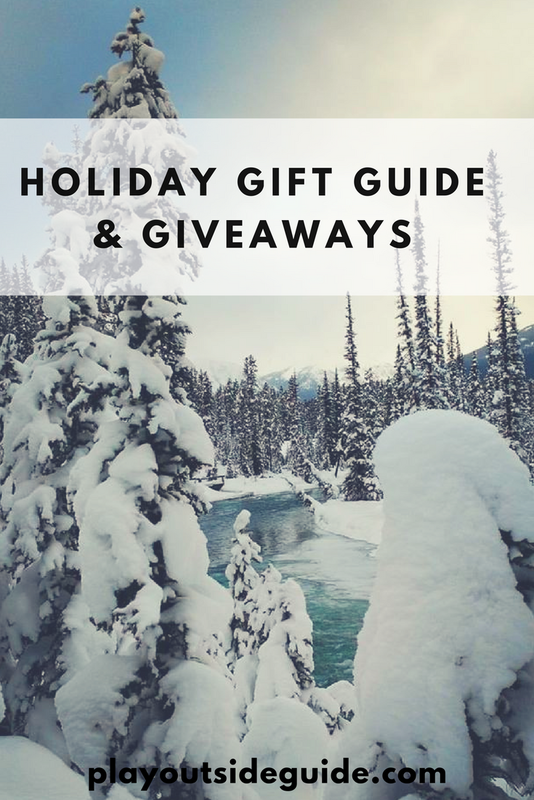 After entering the giveaways, please scroll down for MORE Gift Guides and Giveaways from my fellow Outdoor Families Bloggers! Check out MORE Holiday Gift Guides and Giveaways! Wilder Child - The Ultimate DIY, Handmade and Unique Gift Guide for Your Wild Child! We’ll Eat You Up We Love You So - Outdoor Gifts for the Little and Big Kids in Your Life! I also love the terradoras! Would love to win a pair of winter ones! I love the keen terradoras!! I would order the Elsa fleece sneakers. They are so cute! Maybe the dover shirt for e-coths. But too many awesome shirts to choose from. The Ashford Tunic looks great for leggings. 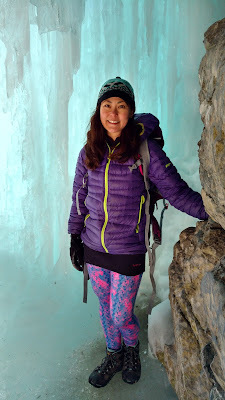 I would use Terramar base layers when I'm hiking or cross-country skiing. I would get the Ecoths Sayer Sweater for my husband. Ooh, and the Newbury top. I would get the Aventure Scarlett Dress. I already have a terramar t-short that I use for mountain biking. With new baselayers, I would use them for under my drysuit when I'm rafting. I think I'd order the women's gypsum or revel boots. I love the terramar long underwear and kids climbing harness. My kiddos are on ski team so I am outside all the time and would love something that would help me stay warm! The Ecoths Donnelly shirt is super rad with the contrasting inner layer. Love the Sun Day Snow tripper hat! I was just admiring the Aventura brielle shirt down at the local shop! I'd wear my terramar base for everything! I like the Venus beanie at Sunday Afternoons. (Actually, I like all their stuff, but that's what caught my eye today). I'm always looking for good socks for being outdoors, and the Icebreaker socks at All Out Kids look pretty cool. I'd use that Terramar base layer set to get me outside with my kids this winter. Hiking, walking to the store, or even just getting out to the park is a lot more fun if we can all stay warm! Would love to win a pair of Keen boots! Been eyeing them up for a while. I would use Terramar Base Layers for hiking. I would get the Ecoths Dover Shirt. I would get the Aventura Ashford Tunic. Awesome gift guide! I'll definitely be using some of these ideas for the family. Definitely would be the Terradora Winter hikers! But there are a couple things on your list I'm going to look up! I would use the Terramar base layers for snowshoeing adventures! I would try the Elsa premium boot, I think! Ecoths Osborne Zip Neck Shirt as a Christmas gift for the bf! I love the Sybil dress. I love the trucker hats! I'd grab my kids some of the Vasque day hikers! I need to replace my Keen Mary Janes and love the leather ones! We love wearing base layers when xc skiing! I would love to try the Terramar base layer for snowshoeing. The Field cap or the Stellar Beanie would be awesome! I would LOVE either the Keen Targhee or Terradora waterproof! I would love a pair of MEN'S TARGHEE EXP's for my husband for Christmas! His low boots are looking ratty! 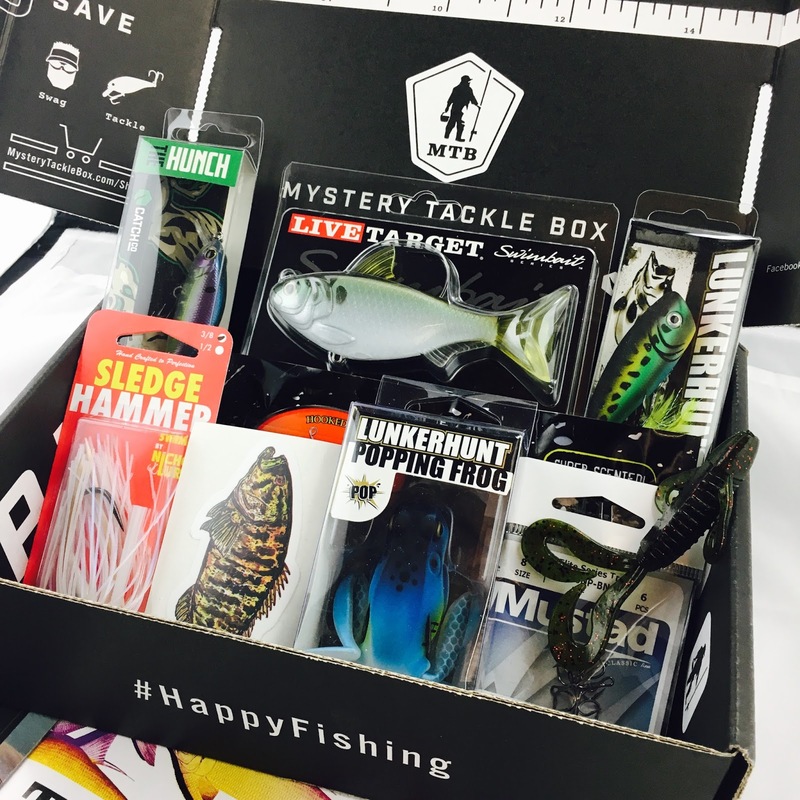 Thanks for sharing these great outdoor gift ideas! I would get the Aventura Bacall Dress. I would order the Keen Women's Terradora shoes. I would use the Terramar Base Layers for hiking. I would get the Ecoths Zander Shirt. The Ecoths Barrett Sweater from e-cloths - perfect for fall and winter! If I won a base layer set, I would use them for late fall and winter hiking adventures and snowshoeing to keep comfortable and cozy! The Adventura top I would select would be the comfy, cozy Zayda Tunic! Oh Yes! Love my Keens, wouldn’t mind another pair?! OMG I just love all the Keen boots. I would choose the WOMEN'S MORRISON LEATHER MID!! Thank you! I would use the Terramar base layers for winter hiking. I would get the Ecoths Webster Sweater. I would get the Fallon Dress for my wife. I'd love the Keen winter boots! I'd get winter hikers for sure! Amazing giveaway! Thank you Karen :) I would honestly love any of these prizes - Keens, any of the kids stuff, all the prizes are awesome!!! I'd order the Women's Hoodoo III Lace Up boots in the coconut colour! They'd be a big step up! I like the Revel 3 boots. Thanks! I think the ecoths Elton hood ie would be my choice. Thanks! I would choose the Cybil Dress. Lots of great choices! id love the terramar wool baselayer for chillt skiing days! I would order the Aventrua Amaya Top in white! Always on the lookout for longer tops so I'd give the Aventura Newberry a try. I like the sound of gingerbread pancakes! And for hubby I'd pick out an Ecoths Charlie sweater. What a fantastic set of giveaways!! I would love to get a climbing harness for my toddler... Time to get him on some rock! commenting for another giveaway - these are AWESOME! I visited the aventura site, and fell in love with the clothing there! Hard to pick a favorite, but the Bronte dress is beautiful! The ecloths line of Men's clothing is awesome! I especially like the Charlie sweater, it's simple and i like the detailing on the collar. It looks oh-so comfy! Terramar Baselayer? No way! We love merino wool at our house, warm and breathable. I'd go hiking and camping in a new set, in the middle of the winter! If i was going to order from Keenwould be the Terradoras apré or the Durand polar! I would use the TerraMar baselater to keep warm outside in Idaho. Tough choice, but I might go with the Ecoths Sherman Shirt. Visit Aventura and let me know which shirt you would get if you won! : I like the Amaya top. Visit All Out Kids Gear and let me know what you you would get your kids for Christmas! The DEUTER FOX 30 KIDS BACKPACK! I would use the Terramar base layers for camping and any activities outside in the winter! From Keen, I would love to have the WOMEN'S BERN BABY BERN II TALL boots. From Lannie rae Gourmet, the SUGAR PLUM SPICE mix looks good! From Adventura, I like the Briesa Sweater. I love the Corinne Sweater from Ecoth!! So super cute! I lvoe the Atwood Cardi from Aventura!! Classic and looks super comfy! I would use the Terramar base layers for snow shoeing and sledding fun this winter!! 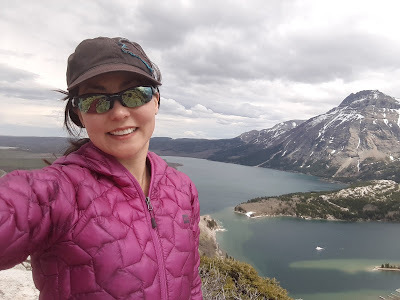 I would give the Terramar base layers to my wife and she would use them for hiking. I would get the Ecoths Noah Zip Neck Sweater. The KIDS' STELLAR BEANIE is nice. I would order the WOMEN'S KACI FULL GRAIN SLIP-ON. WE would use the clothing for hiking. I would get a shirt for my husband. I would outfit my daughter in the KEEN BIG KIDS' ELSA L WATERPROOF BOOT in captain's blue/sugar coral. I want her to have fun in comfort and warmth. Terramar base layers - for snow shoeing near Mt Hood! LOVE my KEENS I don't trust any other boot to give me the stability and traction I need particularly in the winter months! They are comfortable, look GREAT and are super durable, LOVE LOVE LOVE my KEENS, and would certainly be very happy to get another pair! Terramar sports I would use your fantastic Merino Wool top, bottoms and socks to keep me warm and dry while I'm winter hiking with camera trying to get my best wildlife photos! I get so involved in what I'm doing that I lose all track of time and don't realize that I'm freezing until I get home, so this set would get me home warm and not having to thaw out for 3 hours after I get home! I would get the Ecoths Tobin Henley if I won because it is totally my style, just because it's branded as "mens" wouldn't stop me from wearing it, I wear lots of mens clothes because quite often I like the fit much better! Aventura I'm ALWAYS cold-ish so I'd be happy with one of your shirts to keep me toasty and looking stylish, thanks for the chance! I would love to be comfortable and warm wearing Terramar Base Layers while snowshoeing, tubing down the mountain, and hiking. Bring on the snow! I have been eyeing the Terradora or Targhee hiking boots since I need a new pair so if I won I would choose one of these. Ecoths has some great clothing. Love the Newberry Top. Think I might be making a bit of a list for my husband with some of the suggested brands on your list! It'd be really hard to choose which Keen's to get. There are so many to choose from. Would love to buy the Keen TERRADORA shoes in blue! (favourite colour)....although really I'd love most of their shoes, lol. My youngest would love the kids swallowtail trucker hat! Would love the Aventura Pria Tunic! I would get all my kids a BLACK DIAMOND WIZ KID CLIMBING HARNESS! Great idea! I love the Women's Hoodoo III Lace Up boots! The Charlie shirt would be great! I would wear the Terramar base layers hiking! The Aventura scarlet dress is so cute! I would get the Big Agnes little red sleeping bag from All Out Kids! I went to the Lannie Rae Gourmet site and the Cherry Amaretto Flavor sounds so delicious for the winter months. I could really use the Terramar Sports "Top to Bottom Merino Wool" set for skiing this year (I currently just wear jeans and a T-shirt under my snow clothes)! I like the styling of the Charlie shirt. I love the Kaci Women's slide in tortoise shell Marsala color and need them so bad! I will keep all my fingers crossed tight! Thanks so much for a chance. WOMEN'S KACI WINTER WATERPROOF MID caught my eye. Ecoths Osborne Zip Neck Shirt looks really nice. Hubby would love it for Christmas. I would be excited to receive the Lexi flannel top in Quiet Harbour blue. I would like the presidio style. I would choose the ashford tunic in biking red from ecloths. I would love the aventura sybil dress. would love to get my husband some of ecoths polo shirts! Love your blog! Thanks for putting it together. Elsa boots! !